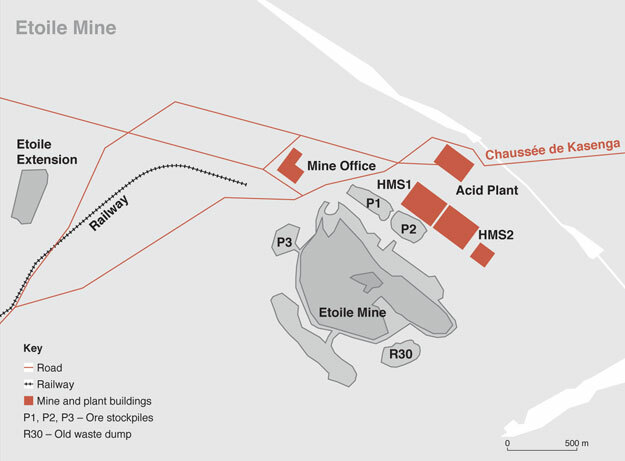 Etoile is an uncomplicated surface mine that is relatively easy to operate. The upper ore body is oxide, then there is a mid section of mixed ores and the lower levels are suphides. The oxide and mixed levels are readily and cost effectively available for surface mining by conventional truck and shovel operation. A Life of Mine Study was undertaken by Africa Mining Consultants Ltd and has confirmed that extraction of the sulphides will also by surface mining. Although Chemaf operates its own fleet of mining equipment, it has proven more cost effective to allow contractors to mine the site. Chemaf still retains the ability to deploy its own mining fleet.